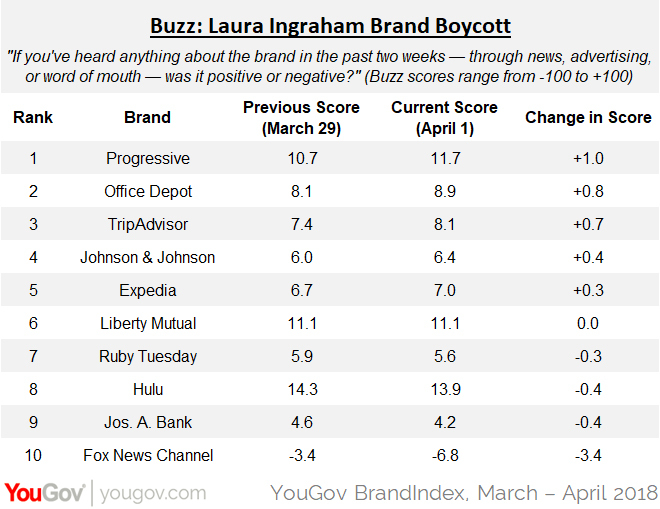 Early data shows the Fox News Channel brand sustaining more consumer perception damage than any advertiser boycotting Laura Ingraham’s television show so far, according to YouGov BrandIndex. Since advertisers began pulling out following Fox News Channel host Laura Ingraham’s incendiary tweets about Parkland shooting survivor David Hogg, nine of them have shown negligible movement in their Buzz score. This indicates consumers are generally not swayed positively or negatively toward their actions so far. However, Fox News Channel’s Buzz score dipped in the first days following the advertisers' announcements, with more consumers hearing negative things than positive, indicating the network could suffer from the controversy. For the Buzz score, YouGov asks respondents: "If you've heard anything about the brand in the past two weeks — through news, advertising, or word of mouth — was it positive or negative?" A score can range from -100 to +100 with a zero score equaling a neutral position.